From “Miracle on 34th Street” to “The Santa Clause” (and sequels), Santa Claus has been the subject of movies and TV specials, and used to sell everything from Coca-Cola to M&Ms. The origins of Santa Claus have tantalized filmmakers, who’ve come up with all sorts of fanciful tales about how the gift-giver came to be, where his elves came from, and why he has reindeer. Here’s a clip from “Santa Claus Is Comin’ to Town,” a 1970 stop-motion animated special that may be one of the more … imaginative versions of the origin tale. In the real world, Santa Claus is a blend of Norse, Germanic, Catholic and Dutch traditions, filtered through folklore and two major 19th-century influences — Clement Moore’s poem “A Visit From St. Nicholas” and the work of artist Thomas Nast. Our current iteration of the rotund man in a fur-trimmed red coat is a gift of the Coca-Cola Company, a creation for an ad campaign in the 1920s (and not coincidentally, he’s wearing the signature colors of the beverage maker). But Catholics know that the true beginning of the Santa Claus legend was in 4th-century Turkey, with the famed Bishop Nicholas of Myra. Born into wealth, which he inherited while young, devoutly Catholic Nicholas gave all he had to assist the sick and needy. Made a bishop early in life, he became known for his generosity, and his love for children and for those who go down to the sea in ships. Bishop Nicholas suffered for the Faith under Roman Emperor Diocletian and spent time in prison. He died on Dec. 6, 343 A.D., and that day is now his feast day. Nicholas’ fame grew after his death, and many legends are told of him. 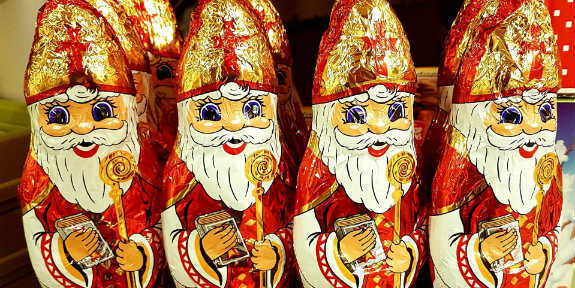 European tradition states that children who leave their shoes out on St. Nicholas Day Eve find them filled in the morning with treats and small gifts (if they’ve been good). According to news reports from October, the tomb of Saint Nicholas may have been found in southern Turkey — under a church named in his honor, in the town where he was born (where else, indeed?). But does this mean Santa Claus is dead? Of course not. St. Nicholas is in heaven, waiting to pray on our behalf. And as for Santa Claus, he is the spirit of generosity, and as long as that exists, he lives on. Oh, and a group of filmmakers is trying to make a movie about “Nicholas of Myra,” which, according to the IMDB, is to come out in two parts, in 2018 and 2019. Remember to watch the skies on Christmas Eve, when the North American Aerospace Defense Command (NORAD) begins its annual satellite tracking of Santa Claus’ journey across the world. Head to the official site to follow the Jolly Old Elf as he makes his rounds.